For the bodice you will need some lace or embroidered net with a pretty scalloped edge/border, and it needs to be a minimum of 18cm wide (wider if you intend to do a full bust adjustment). I’ve included a few examples that will work here – you will notice mine are very bridal (funny that!) but they are often available in black and other colours. 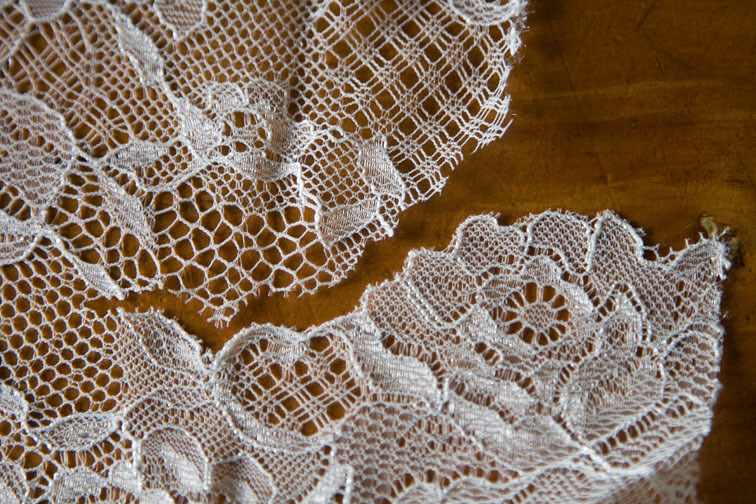 Lace is often made of cotton or nylon, so may be dyeable if you can’t find the perfect colour. Be aware that pale colours are very see-through, and black is far more discreet. 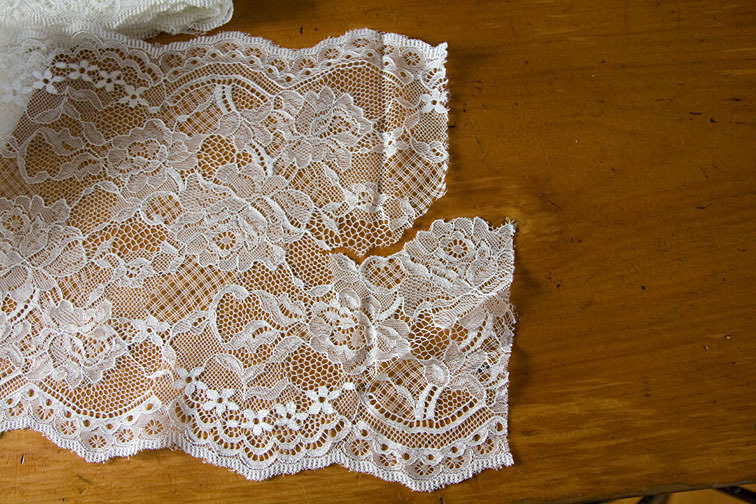 There are a couple of alternatives – underlining the lace, or adapting the pattern to have lace along the upper edge only – and I will show how to do this in the sew-along. Look carefully at the pattern, and you can see how the floral design can be separated into two pieces. Separating is often a lot simpler than this one which is quite intricate. If the galloon is wide enough it can be more economical. If it is not wide enough you can often use it ‘whole’ too, which is what I did for the pale blue version above. You need to be very accurate, and it takes a while to do! Here is an example of the same lace design, but with cording. The cording makes it a bit easier to cut around and couch the edges. A close up – isn’t it just gorgeous? I do have photos of the gown this was used on – must post them one day! You can also use a wider lace fabric, but we will only use the scalloped border for this design, so make sure you buy enough to cut a shell top or something out of the remainder! UPDATE: I forgot to mention that none of these laces are stretch laces, although by nature lace or embroidered net has some give. How much lace do I need? The repeat doesn’t always coincide with the scalloped edge – see how every third scallop in this one is different? The pattern repeat here is designed to trick you and is actually the length of three scallops! The smaller the pattern repeat, the less meterage you will require if you want to match the lace pattern at the seams, which you do. For this pattern I have calculated the meterage you require per size, plus the number of additional pattern repeats required to ensure you can match the seams on the pattern. For example – I need 1.40m plus 4 pattern repeats, my pattern repeat is 5cm, so I need a total of 1.60m. 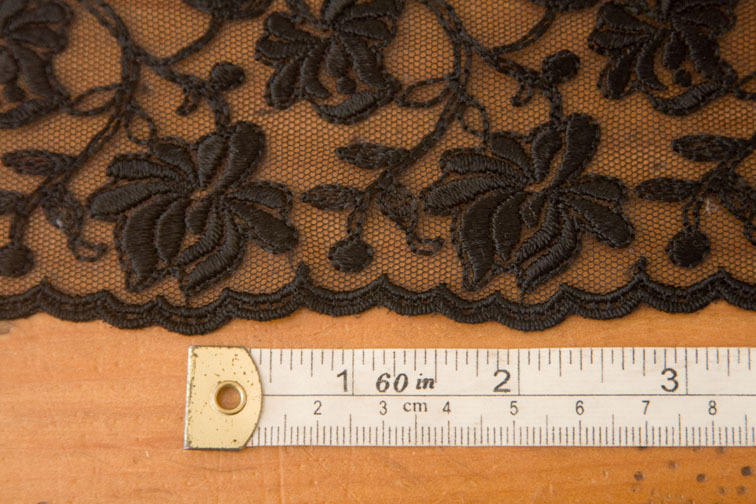 If your lace is wide enough and has a double border, you may only need half of this amount. It is a good idea to take the pattern to the store and lay it out to check. I always err on the side of too much rather than too little! strength – we will be attaching the straps directly to the lace so it must be able to take some strain. 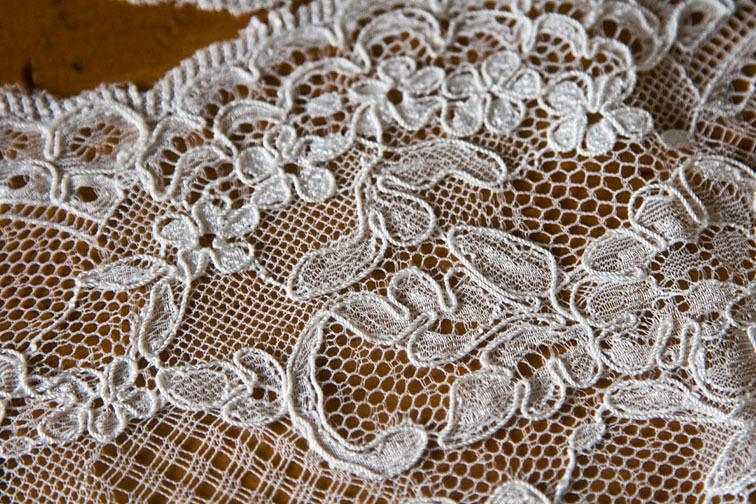 Most laces look deceptively delicate but are actually quite strong – but I wouldn’t use the antique stuff off your great-grandmothers wedding dress just in case! If you are unsure, unroll a couple of metres and hold the fabric up against yourself so that the true bias hangs down your centre front – this will give you an appreciation of how the fabric will handle in the finished garment. If it feels gorgeous and slinky, you’ve probably got the right stuff! Because the skirt is bias cut, the most suitable fabrics are evenweave, that is, the weave is relatively even in both warp and weft directions. Unfortunately with dress fabrics this is not usually the case! If you were to cut a long rectangle of your fabric on the true bias and hang it for a couple of days, one side will often end up longer than the other because of the different weave directions. Every fabric is different – it depends on the looseness of the weave and heaviness of the cloth as well as the weave. Satins like the ones recommended above are usually ok, but there can be some distortion of the side seams and I will show you how to deal with this as we sew – don’t worry, it’s easy! I used to design a lot of bias georgette dresses and I’d determine this adaptation during pre-production, but for one-offs it is easier to do it as we sew. It is best to avoid napped, diagonal and twill fabrics in bias designs, as the pile and lines go all over the place. 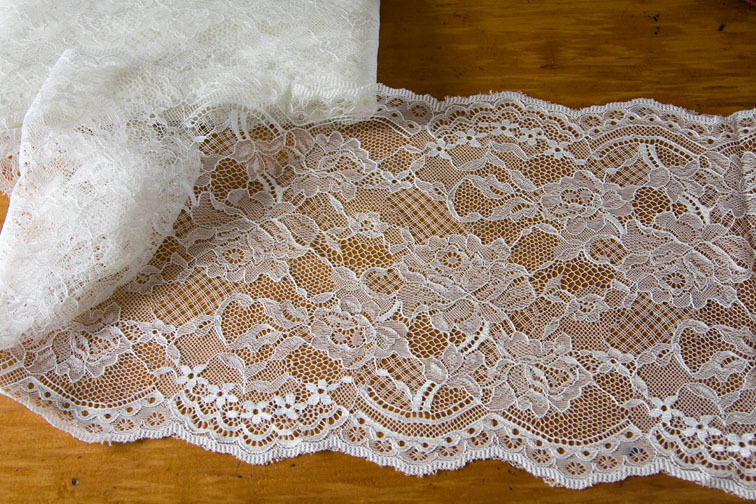 If your lace and main fabrics are contrasting, you will need two colours of thread! I pinned this cheapie flower in place and it transforms the whole bodice. 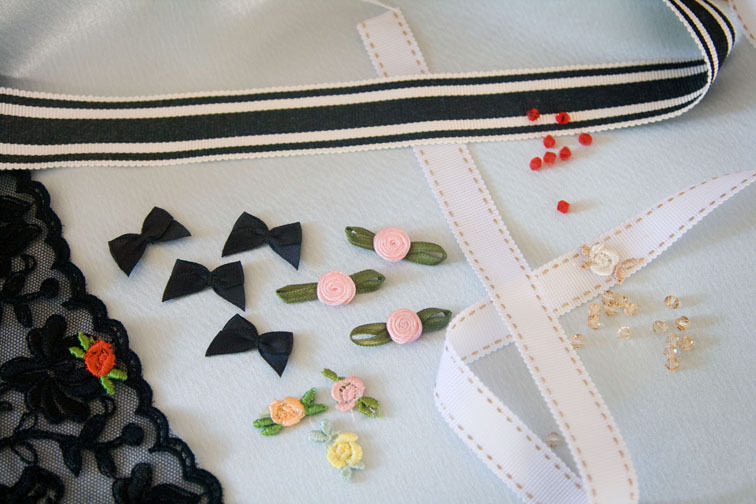 I’ve used mainly stash flowers and bows that I had, but you could be more adventurous and recycle a trim from some old lingerie, or have fun making your own from some ribbon and some beads. Have fun selecting your fabric, and don’t forget to ask any questions in the comments! I hope your pattern downloads all went OK too, if there were any problems please let me know, and which method did you prefer – Google or Scribd? Sharpen those shears, because we’ll start cutting next! I am in no position to make one of these now (Xmas is overwhelming me!) but I am loving following this. It's fascinating and Oh so pretty. Like Karin, my “gottasews” won't let me participate but I am loving all this wonderful info and great pics you are sharing. I loved that slip when I first saw it but I know I can't sew one now either. However I am learning so much and will read the posts to see what else I don't know! Thanks for so much effort. Looks beautiful – I am thinking that the lace cannot be stretchy? I'm in love with this gorgeous slip but I too will have to wait until after Christmas. I have stretch laces that I'd like to use. Would it be ok to stabilize it with silk organza? I'm going to use some stretch material I have in my stash – though I realize this will mess with the sizing. On that topic – does the pattern come with seam allowances added in, or do we add those on top of the dimensions? This is so pretty. I have some silk fabric, could I use the same fabric for the top part where the lace is? I love the lace but that I don't have on hand. Now the question is, can I do this right now with the holidays, I guess we will see! Your laces are so very pretty. 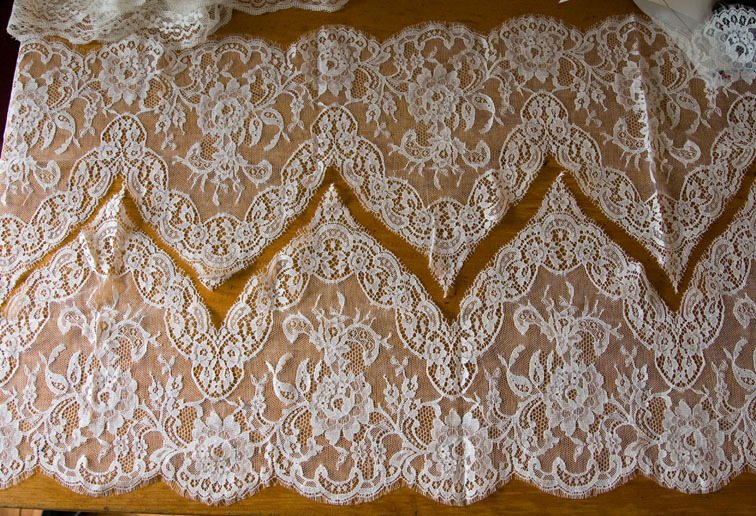 Lace is one thing I have a hard time buying online as one can't tell how stretchy or thin is is; I look forward to hunting down a local source. And you must share a bridal gown someday! Just wanted to say thank-you for the pattern. I will definitely be making this slip, but probably a bit later – too many other projects on the go at the moment. Thanks so much for doing this series! I'll be following, but know that I won't have the time until later. I willl get the pattern now. Christmas is such a busy time I know! 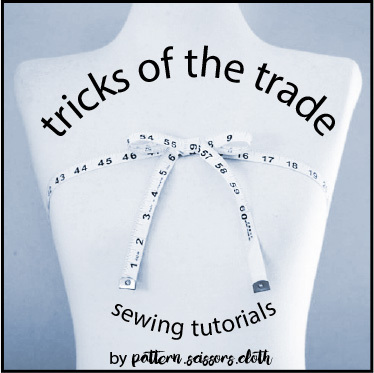 I will gather all the sew along posts in the tab up top so they are easy to find when you do start sewing! 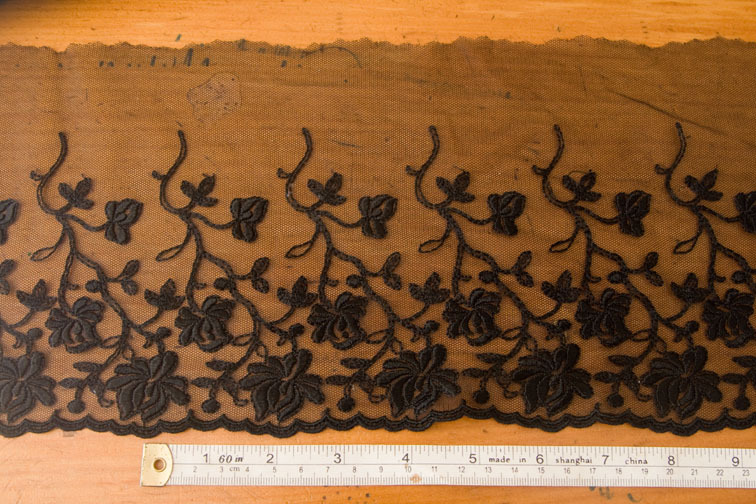 I hadn't thought of using stretch lace. I think if it has low to moderate stretch it would probably work, but the bodice could end up slightly larger. The laces I used are firm, although the net has a slight give. You could try stabilising it, I would probably choose chiffon rather than organza as it is softer and less rigid. I'll show an underlining technique that can be used for this. K-line – you might want to try a size smaller, as the skirt won't drop like a bias one will. The seam allowances are included (1cm). Texan – You could use silk, but I haven't tried this. Remember there is no seam allowance along the upper edge. You won't need one though if you are binding it! 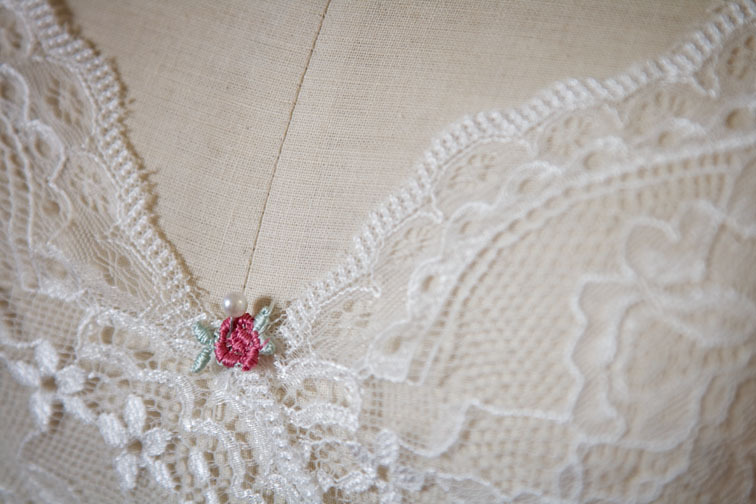 I will show a variation where the lower part of the bodice is silk and the upper is lace, it allows you to use a narrower lace which might be easier to find. 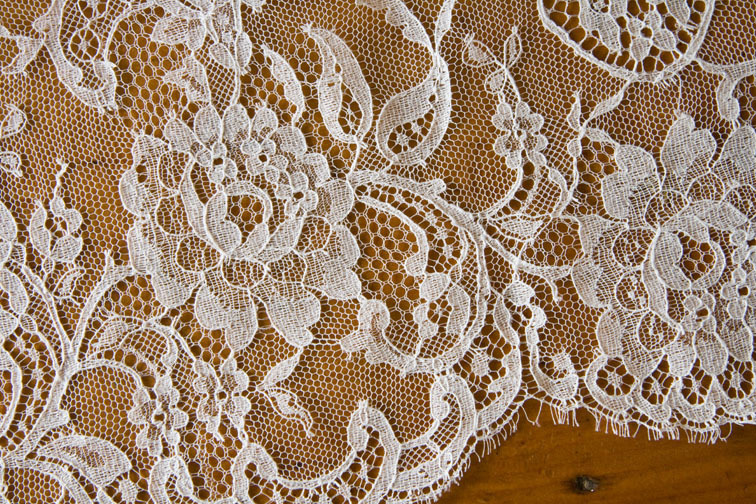 I have a narrower lace, and was going to look for a wider one, and just saw your comment. But I might also just look for another one when I'm out tomorrow. Also, as luck would have it, ran out of my tracing tissue! I hope this isn't a bad omen! Well DUH I didn't even think of the edge of the lace not being raw edge and the fabric would be. mmm maybe I can get to town for some lace! I too am loving reading your details and am very enticed. But, being 5 months pregnant, it will be a while before I can enjoy. Still, lace and silk are fabrics that intimidating to me. Getting to see your treatment of them in such detail will be such a learning experience. Thanks for sharing! Hopefully in a few (ok probably several) months I'll take a crack at it myself! Google or Scribd, and you don't need a facebook account. The links are in the Sew-Alongs tab. This would definitely be a fun project, I'm going to have to find some lace and give this a whirl! Hey ! It’s so preeeetty ! I want to do mine !! But I have a question… Have you used an elastic lace or not ? Thank you! I used both a non-stretch lace and an embroidered net for my samples, so it works fine without stretch. Have fun making yours – and do share!